Cultivate Life-Long Learners: God has put in the heart of every child a joy and passion to learn. This is not something that a school can create. Rather, we cultivate the seed that God has already planted. Learning should be a life-long process, and MCA wants to provide students with the tools necessary to accomplish this. 1. Wise: At MCA we want our students to be wise knowers. The foundation of wisdom is knowing the living God as He is revealed in the Scriptures. 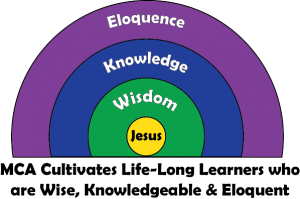 The Apostle Paul said that Jesus Christ has become to us “wisdom from God” (cf. 1 Cor. 1:30), and Solomon said, “The fear of the Lord is the beginning of wisdom” (Prov. 9:10). 2. Knowledgeable: We want our students to be fascinated with all there is to know in the cosmos. St. Augustine said, study the Scriptures—and then study everything else. We want our students to leave no stone unturned as they explore all that God has made, and all that man has done with that creation, both good and bad. 3. Eloquent: Finally, we want our students to be eloquent. This doesn’t just have to do with good communication skills. In our communication with others we are not only told to “speak the truth,” but to do so “in love.” Eloquence is a manner of being; a grace. Eloquence doesn’t speak down at people. Rather, it frames a dialogue in truth while esteeming the other as a bearer of God’s image. The logical outcome is that graduates from MCA matriculate to become culture-changers. A culture-changer is someone who considers carefully the world around him or her and decides that things need to change. While there are many ways to affect change, some passive and some active, a culture-changer will not permit the status-quo to remain unchallenged. Our desire, of course, is that this challenge will be expressed by a wise, knowledgeable, and eloquent graduate.